I love wild finches. They are small, colourful much of the year, and active beyond belief! 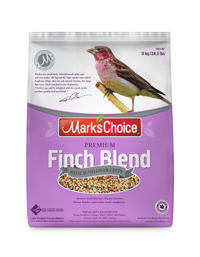 After many trials, we have come up with a mix that not only attracts finches but song sparrows, evening grosbeaks, dark-eyed juncos and nuthatches too. It is a special mix of pure white millet, red millet and canary seed plus 30% nyjer and 20% sunflower hearts.